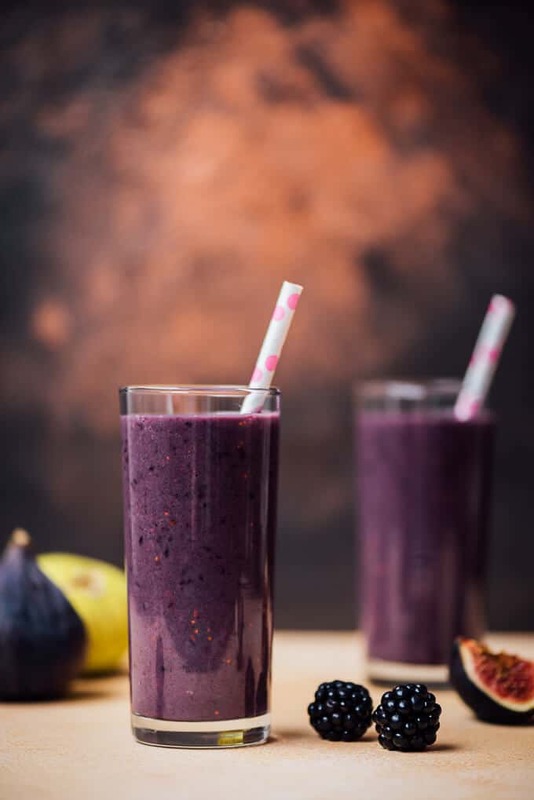 Blackberry Fig Kefir Smoothie is a quick way of getting vitamins and nutrients in the morning. This is the best way of including kefir in your diet. Kids will fall in love with the taste and color. They will definitely ask for more. This post was originally published in 2016 and we are updating it today with additional information. Let me start with what I love most about this kefir smoothie: That amazing color. I fell in love with that color purple as I blended the ingredients when I made it for the first time. Watch the video below to see how it got that impressive color. I do love the taste too. Knowing that this is a healthy drink is a bonus. There are so many benefits of kefir because it is a good source of vitamins, minerals and probiotics. I think that’s why our 3 5 year-old son’s doctor highly recommends it. He says unlike what most people believe, milk doesn’t have many benefits for our body. On the other hand, he claims that kefir is a perfect source of calcium and protein. Thus, he suggests we include kefir in our daily diet as much as possible. I’m not going to lie – a glass of smoothie is never enough for me as breakfast. I always love a rich breakfast with several foods in small portions just like at a typical Turkish breakfast. However, I sometimes need a quick breakfast, especially on weekdays. 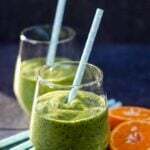 This smoothie is a perfect option for those times. Although we find kefir quite addictive on its own, it makes a great smoothie base. Blend it with any fruit you like and start your day with a satisfying probiotic kefir smoothie that keeps you full until lunch time. This is the easiest breakfast ever! Watch the video and see how your morning kefir smoothie is ready in seconds. I’m sure you come across kefir smoothie recipes for weight loss when you search for kefir recipes. I don’t have any idea if it has that effect, but the doctor recommends it for our son so that he gains weight in a healthy way. I love how our little gourmet is open to new tastes. When I first gave him a glass of plain kefir, I told him it’s a kind of ayran as they are both tart. He loved it at the first sip and he’s had kefir at breakfast and dinner since then. This blackberry fig kefir smoothie is not for our son’s breakfast. 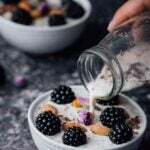 He prefers drinking kefir with no additional flavors because he loves it tart and pairs with other breakfast foods like Turkish egg dish Menemen. On the other hand, he loves smoothies like this as an after school snack. Although it is naturally sweetened with banana and figs, this smoothie satisfies your sweet tooth too. Other flavors are totally up to your taste. We used blackberries because my husband and son love them and figs because I love them. Luckily, we are in the season of both. If you love these fruit as much as we do, give this recipe a try. If you don’t, use your favorite fruit and create your own kefir smoothie recipes. Kefir smoothie made with blackberries and figs. Sweetened only with banana. Makes a perfect summertime breakfast. Put all ingredients in your blender. Blend in high speed until smooth. Serving immediately is significant as it loses color and taste when waited.